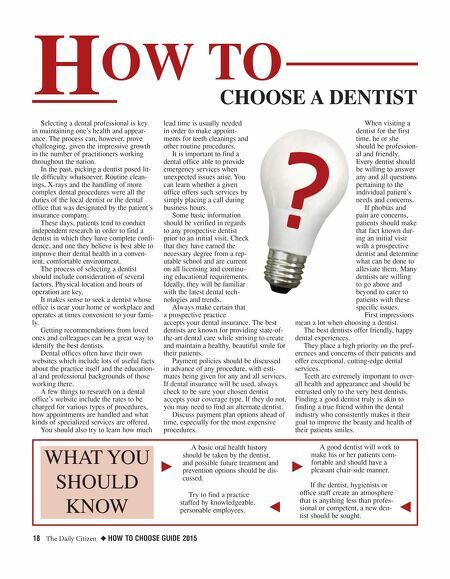 18 The Daily Citizen ◆ HOW TO CHOOSE GUIDE 2015 Selecting a dental professional is key in maintaining one's health and appear- ance. The process can, however, prove challenging, given the impressive growth in the number of practitioners working throughout the nation. In the past, picking a dentist posed lit- tle difficulty whatsoever. Routine clean- ings, X-rays and the handling of more complex dental procedures were all the duties of the local dentist or the dental office that was designated by the patient's insurance company. These days, patients tend to conduct independent research in order to find a dentist in which they have complete confi- dence, and one they believe is best able to improve their dental health in a conven- ient, comfortable environment. The process of selecting a dentist should include consideration of several factors. Physical location and hours of operation are key. It makes sense to seek a dentist whose office is near your home or workplace and operates at times convenient to your fami- ly. Getting recommendations from loved ones and colleagues can be a great way to identify the best dentists. Dental offices often have their own websites which include lots of useful facts about the practice itself and the education- al and professional backgrounds of those working there. A few things to research on a dental office's website include the rates to be charged for various types of procedures, how appointments are handled and what kinds of specialized services are offered. You should also try to learn how much lead time is usually needed in order to make appoint- ments for teeth cleanings and other routine procedures. It is important to find a dental office able to provide emergency services when unexpected issues arise. You can learn whether a given office offers such services by simply placing a call during business hours. Some basic information should be verified in regards to any prospective dentist prior to an initial visit. Check that they have earned the necessary degree from a rep- utable school and are current on all licensing and continu- ing educational requirements. 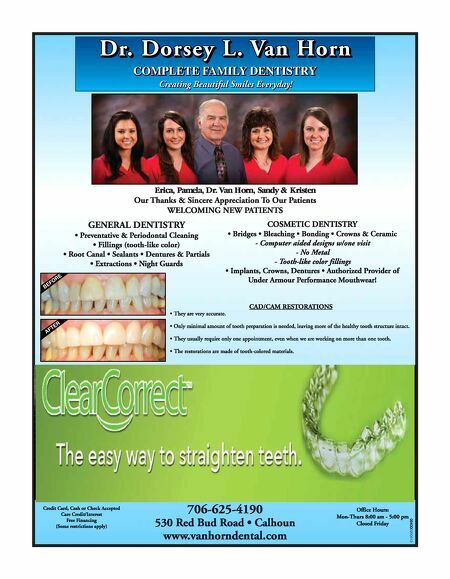 Ideally, they will be familiar with the latest dental tech- nologies and trends. Always make certain that a prospective practice accepts your dental insurance. The best dentists are known for providing state-of- the-art dental care while striving to create and maintain a healthy, beautiful smile for their patients. Payment policies should be discussed in advance of any procedure, with esti- mates being given for any and all services. If dental insurance will be used, always check to be sure your chosen dentist accepts your coverage type. If they do not, you may need to find an alternate dentist. Discuss payment plan options ahead of time, especially for the most expensive procedures. When visiting a dentist for the first time, he or she should be profession- al and friendly. Every dentist should be willing to answer any and all questions pertaining to the individual patient's needs and concerns. If phobias and pain are concerns, patients should make that fact known dur- ing an initial visit with a prospective dentist and determine what can be done to alleviate them. Many dentists are willing to go above and beyond to cater to patients with these specific issues. First impressions mean a lot when choosing a dentist. The best dentists offer friendly, happy dental experiences. They place a high priority on the pref- erences and concerns of their patients and offer exceptional, cutting-edge dental services. Teeth are extremely important to over- all health and appearance and should be entrusted only to the very best dentists. Finding a good dentist truly is akin to finding a true friend within the dental industry who consistently makes it their goal to improve the beauty and health of their patients smiles. H OW TO CHOOSE A DENTIST WHAT YOU SHOULD KNOW k j A basic oral health history should be taken by the dentist, and possible future treatment and prevention options should be dis- cussed. Try to find a practice staffed by knowledgeable, personable employees. k j A good dentist will work to make his or her patients com- fortable and should have a pleasant chair-side manner. If the dentist, hygienists or office staff create an atmosphere that is anything less than profes- sional or competent, a new den- tist should be sought.